Dust off your spirit of adventure and head south across the U.S.A. border on highway 15 from Nogales, Arizona, to El Fuerta, a small Spanish colonial town sitting on the Fuerta River in Mexico. The drive is long and roads poor with many tollbooths waiting with out-stretched hands, often manned by the military holding their AK47s at the ready. Rustic, burro-pulled carts filled with grass, harvested from trash-covered medians, ramble slowly back to hungry cattle. Grottos, open to travelers, dot the highway. Low, small shacks roofed with corrugate tin, supported by wooden poles, house the laborers. All have small verandahs for shade. Their mud floors swept clean and water needs brought in from common wells. The Sonoran desert acts as a background to these humble dwellings and organ pipe and saguaro cacti reach for the sky bringing green relief to the dry and sandy plains. Skinny livestock and chickens seek nourishment from the powdery soil, and hunch-backed turkey vultures patiently bide their time while brightly decorated cemeteries, their dead lying to the east, await sunrise in the hopes that life will again be restored to the decaying bodies there. But just a minute - the adventure is just beginning - follow the road south as it stretches out ahead of you and the real Mexico begins to reveal its beauty. On arrival in the foothills of the Sierra Madre you will find the charming little town of El Fuerta and at the base of an old fort a 350 year-old inn awaits the weary traveler. Salmon and purple bougainvillaea blooms spill over the burnt orange and purple colored adobe walls, and an old weather beaten door creaks open in welcome. Whitewashed walls held together with heavy timber beams and wooden ceilings are graced with a center fan that moves the afternoon eddies. Vibrant electric blue and bright yellows peer out from the plant infused courtyard, and stairs invite you upward to the comfort of peace- filled guestrooms for an afternoon siesta. Later, under the light of mother moon, margaritas can be sipped, while Mexican dancers twirl brilliant colored skirts and their partners stamp booted feet on the painted tiles, whistling to strumming guitars. Their smiles joyfully reflecting the exuberance felt in the folkdances. Brightly decorated cemeteries house the village dead. 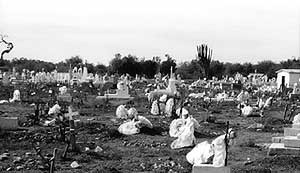 Close by, a small village of Tehueco Indians, called Mayo, live self sufficiently, raising crops including corn and beans, wheat and tomatoes that grow close to the irrigation canals that make the dry soil fertile. In the village under a cloudless sky, tourists are treated to the rare sight of the sacred deer dance. Dried moth cocoons are strung together and then bound around the dancers’ legs. Leather belts with hanging deer hooves click and chatter in time to music being played on ridged wooden scrapers placed on gourds that resonate loudly. Maracas in hand, a deer head balanced atop their heads, and scarves covering their mouths, a solemn duo prance with callused feet to the steady beat emanating from the background, giving thanks to the deer. A welcome meal of homemade tortillas is offered by one of the families who own many of the cows that graze in nearby corrals. Dry, white corn together with acid lime juice is boiled in a clay pot making hominy over an outside mesquite wood fire. After being ground with a rock, the dough mixture is then rolled into balls, flattened and placed onto a hot tin dusted with bone ash to prevent the tasty cakes from sticking. The cooking area is outside on clean, hardened, ground while inside the little house one can see a washing machine set in a place of honor. In the distance the laughter of children in sparsely furnished classrooms can be heard. ‘El Chepe’, the Copper Canyon Express clatters into the once important mining town of El Fuerta and comes to a halt at an old building. Eagerly waiting for the train are young men willing to help with luggage, thirsty for a few pesos. Also vying for attention are scrawny dogs, with long hanging teats, stirring up the dun colored dust causing it to puff up into the still air. Perched in a kapok tree a vermilion flycatcher watches the antics of those below him, his red breast mirroring the early morning sun. On boarding the train one finds deep luxurious seats, its picture windows frame the changing terrain and as the coaches leave the thorn desert, the deciduous and tropical forests appear. The diesel-powered engine edges its way upward through 86 tunnels and across 39 bridges spanning the canyons. As the train ascends even higher into the Sierra Madre, one can see beautiful waterfalls that carve grooves into the cliffs, and the purple-flowered amapa trees glowing in the distance, pushing their way up through dense copses of oak and pine. 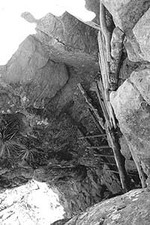 Scurrying up steep ladders from their cave dwellings from ridges below, the pretty, sloe-eyed, Tarahumara women appear on the mesas ready to sell their wares. Children are secured to their mother’s backs by rebozos and the beautiful baskets made from pine needles and sotol are bundled together and carried in enormous plastic bags, while material for yet more baskets balance on their heads. Gracefully walking with their loads to sites in which to sell their handicrafts, they sit patiently, avoiding each other’s eyes, quietly conversing while weaving the intricate containers. The men tend to goats in the valleys, whittle wood to make musical instruments and fashion ladders to access their homes. Often, to help out the women, these men will trek to the base of the Sierra Tarahumaras to harvest the lily leaves used for the woven creations. In the 1500s the Spaniards drove the Raramui inland and changed the Indians’ name to Tarahumara, a word that means ‘foot runners’. Now a peaceful people, they are the second largest ethnic group after the Navajo Indian. They love fiestas and their dances and music are their way of praying and giving thanks for everything that happens in their lives. The men dress in white baggy pants and loose shirts, and bright bandanas are tied around their heads. In areas far from civilization, they may still wear loincloths tied loosely around their bodies like large diapers. The women wear colorful multi-layered skirts that often take up to 8 yards of material. Tied around their heads are scarves that protect them from the searing sunrays. On their feet are sandals constructed from rubber tires and held together by leather throngs above which knitted leg warmers are worn. The children usually go to boarding schools during the week due to the vast distances they have to travel to get an education. The parents are then assured that the children are well fed, however, once the children reach maturity, which may come at any age, they often leave school with their education unfinished. For recreation, the Tarahumara are known world wide for their endurance races. They can run up to 72 hours non-stop bare-footed, often outrunning referees on horses. During long distances they will be lifting a wooden ball with an elongated spoon shaped stick, then hoisting it with their feet and chasing after it. Bets are placed on the competitors and the winnings are taken and distributed among the villagers of the victor. Here they firmly believe in ‘korima’ – which means sharing what you have with those whom are in need. Hikers can visit these reclusive natives in picturesque villages by following old trading trails. However, hikers should be prepared to experience three completely different ecosystems from the evergreen forests to the desert dominated canyon floor and dress accordingly. Here, then, is a taste of the true Mexico. A unique land, with warm and friendly people. Take time to visit our neighbors to the south and savor their every delight. You will be glad you did.